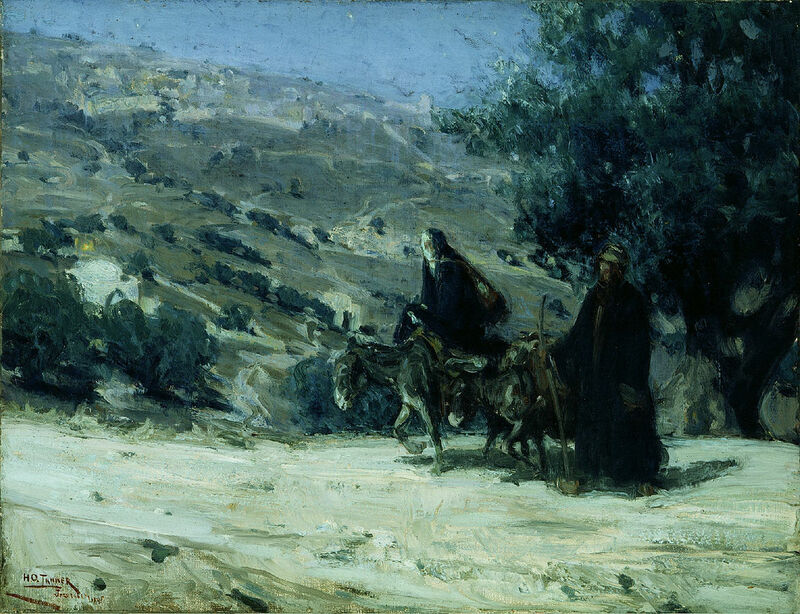 A beloved biblical theme of the African American artist Henry Ossawa Tanner (1859-1937) was The Flight Into Egypt (Matthew 2:13-15). Over the course of his artistic career he painted it at least a half dozen times. One surmises that it was a significant subject for him as one who took ‘flight’ in 1891 from America to Europe (France, in particular) in order to find security to develop his art beyond persecution and prejudice. Being drummed out of your art school by fellow students with an easel strapped like a cross to your back is not an auspicious way to start your career as an artist. However, this is what happened to Henry Ossawa Tanner (1859-1937), the most distinguished African American artist of the 19th century and the first African American artist to attain a reputation abroad. Further, he was also the first to portray black people with their total humanity and dignity and to face full force the indignity of the caricature of his people. Although filled with doubts and anxiety from many daunting directions, especially due to his race, Tanner was determined. His Christian family heritage and his personal faith sustained him. His parents were remarkable, breaking all stereotypes one might expect of black Americans in the 19th century. His mother, Sarah Miller, was a slave sent by her family from the American south to Pittsburgh, Pennsylvania via the Underground Railroad. These circumstances did not prevent her from being literate and well read. Tanner’s father, Benjamin Tucker Tanner, was a minister in the African Methodist Episcopal Church. He was well educated and articulate. Eventually the family settled in Philadelphia where he became a bishop. It was also in Philadelphia that the young Tanner discovered art. Tanner’s 1899 painting of the Flight into Egypt (Detroit Institute of Arts) shows Joseph and Mary with faces hidden and one presumes the baby Jesus tucked away in the garments of his mother. The three intrepidly press on uphill in the moonlit landscape away from Palestine and beyond the realm of Herod to Egypt, which was still in the domains of the Roman Empire. Ironically Egypt became a place of safety for the Holy Family after being a place of slavery for the people of Israel (Exodus 1-15), reminding us in certain ways today of Germany, having persecuted Jews in the 20th century, welcoming refugees from the Middle East now in the 21st century. It is not surprising that the art of the Coptic Christians of Egypt celebrates The Flight into Egypt. Copts feel blessed that their Saviour sojourned as a refugee with his family in their land, even as they face considerable discrimination in their own country today. The painting reminds us to humble ourselves as we consider our Saviour coming into the world. It helps us to reflect on the fragility of life in a world of uncertainty and violence. The work shows us Jesus as a vulnerable refugee. Henry Ossawa Tanner: Flight into Egypt, 1899, oil on canvas, 50.2 x 64.8 cm. Laurel Gasque is Associate Editor of ArtWay and the author of Art & the Christian Mind: The Life & Work of H.R. Rookmaaker. She teaches Art History at Trinity Western University (Langley, BC, Canada) and Christianity and the Visual Arts at Regent College (Vancouver, BC, Canada). A longer version of this meditation appeared in Radix magazine (www.radixmagazine.com) and is reprinted with permission.